It is with heartfelt sorrow that we announce that Eugene has left us to go fishing permanently. He leaves his wife and best friend Hildegard of 55 years, his 4 children Susan, Elliott, Trevor and Everett, 8 grandchildren April (Elliot), Monique (Sage), Jayden, Raynen, Trystan, Rebekah, Chael, and Beaudy, 2 great grandchildren Zola and Zada. One sister Laverne, 5 sisters-in-law Linda (Allen), Evelyne (Erik), Sylvia (Nestor), Dell (Bill), Darlah, 2 brothers-in-law Richard and Bill, 2 daughters-in-law Rachel and Carrie, his special great nephew Jordan, niece Karalee, and many other nieces and nephews. He was predeceased by his parents John and Mary, two sisters Shelley and Phyllus, his in-laws Peter and Susan Klassen, and one brother-in-law David. Eugene was a resident in the RM of Lac du Bonnet for 60 years and a man who was always working. He was a true outdoorsman and avid hunter. In 1960 he graduated from the Lac du Bonnet Senior School. He spent 27 years as an agent for Esso Bulk Sales in Lac du Bonnet. He had a contract with the paper mill in Pine Falls to cut pulp along with firewood for his many customers. He owned and operated a farm in the Lee River area producing alfalfa and leaf cutter bees, raising cattle, and also had a riding stable. He partnered with Ducks Unlimited on a 90 acre lake migratory game bird sanctuary (Wild Wing Waters) on his farmland along the #313 highway. He also enjoyed 10 years of growing and harvesting wild rice in the Turtle Mountains. He was an elected councillor in the RM of Lac du Bonnet for 6 years. He spent 11 years as a leader for the 4H light horse and beef group. He served as a volunteer fireman for many years. He spent time on the Boards of the Community Club at its inception and onward, and on the Model Forest. 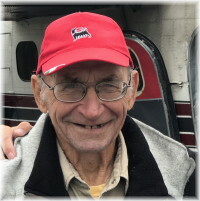 He was a member of both the Lac du Bonnet Royal Canadian Legion and the Lac du Bonnet Wild Life Association. On his retirement he started a live bait business catching minnows and leeches for sale. He also spent and enjoyed many hours assisting his son Everett in developing White Spruce on the Lake seasonal resort off Wendigo Road. We would like to thank his friend Doctor Nick Van Rensburg and staff at Beausejour Hospital, Dr. Bruneau, Rhonda, Connie and staff with Cancer Care in Pinawa, staff at the Pinawa Hospital, and Cancer Care at HSC in Winnipeg. Eugene truly appreciated his family and the many special friends who supported him and sent prayers throughout his courageous battle. A small family gathering has been held and cremation has taken place. A Celebration of Life and Interment will be planned for this summer as per his wishes. In lieu of flowers, if desired, donations may be made to Cancer Care Pinawa, Box 220, Pinawa, MB R0E 1L0. We are very sorry to hear of Eugene passing. You are all in our prayers and thoughts at this time. Josie, Bob Gebauer. So sorry to hear of Gene’s passing. My deepest condolences to Hildegard and family. His kindness will hold a place in my heart forever. Our deepest sympathies to you and your family. Eugene will be missed. So sorry for your loss Hildegard. Hildegard, our sincere condolences to you and your family. So sorry to hear of Gene’s passing. I am sorry to hear about your loss and my thoughts are with you during this difficult time. My condolences to the Obirek family. So very sorry to hear of Eugene’s passing. Hildegard and family- I was heartbroken to hear of Gene’s passing. He was a true friend to me and he will be missed by many. That picture is how I will always remember him. Be a comfort to each other in this time of incredible loss. Uncle Gene had a special place in my heart. I am so glad that my son Stevin & I had the chance to spend the day together with him & Auntie Hilda back in August. He will be missed by many family & friends. My condolences to his family, and especially to Aunt Hilda. He was the inspiration for my writing the Obirek Family tree history book, as he did tell me to write a book, so I did. I wish I was there with all my family at this time to grieve, share stories, give comfort, and celebrate the special man Uncle Gene was, and just visit. I am so sorry Auntie Hilda, Everett, Trevor, Susan and immediate families for your huge loss. I am glad Uncle Gene is not suffering anymore though. He meant a lot to me and I will miss him so much! I have so many fond memories of my childhood spending time at Auntie and Uncles house. It was always an adventure in Lee River. Thank you uncle Gene for the horseback riding, fort building, berry picking, and numerous other adventures that I experienced at your house and grandmas. I am sorry for some of the stupid things we did. I will never forget when all us cousins built a fort from straw and branches and then decided to make a camp fire. We were very deserving of your discipline 🙂 Uncle Gene you left a lasting impression on many lives. One last thank you is for your relationship with Jordan. He grew quite close to you over the last few years at the resort and his bond was one he will never forget. Thank you for welcoming him in your home. You gave him the wonderful memories that I had as a child spending their. He talks about you often. I thank you for all that you shared with him. Take care Uncle Gene. Will miss you so much. Auntie Hildegard, so deeply sorry for your loss. It is with sadness we saw you go. It is with gladness we hold your memory in our hearts. You taught us so much. Thank you Eugene. You were a very special man. Rest In Peace. Sincere condolences to the entire Obirek family. I will always remember Eugene as a strong, generous and hard-working man who was so welcoming of others into his life and home. I hope he is now enjoying the permanent fishing that he so deserves. I wish I were there with all my family at this time to grieve, share stories, give comfort, and celebrate the special man Uncle Gene was, and just visit. I am so sorry Auntie Hilda, Everett, Trevor, Susan and immediate families for your huge loss. I am glad Uncle Gene is not suffering anymore though. He meant a lot to me and I will miss him so much! I have so many fond memories of my childhood spending time at Auntie and Uncles house. It was always an adventure in Lee River. Thank you Uncle Gene for the horseback riding, fort building, berry picking, and numerous other adventures that I experienced at your house and grandmas. I am sorry for some of the stupid things we did. I will never forget when all us cousins built a fort from straw and branches and then decided to make a campfire. We were very deserving of your discipline 🙂 Uncle Gene you left a lasting impression on many lives. One last thank you is for your relationship with Jordan. He grew quite close to you over the last few years at the resort and his bond was one he will never forget. Thank you for welcoming him in your home and family. You gave him the wonderful memories that I had as a child spending there. He talks about you often. I thank you for all that you shared with him. Take care Uncle Gene. Will miss you so much. Love you! We are saddened by your loss, our hearts go out to you and your family during this difficult time. We were saddened to hear of Eugene’s passing. We always found him very interesting to talk to, especially our annual visits to Riverdale, over coffee, discussing anything and everything. Rest in peace. Our sincere condolences from Donnie & Norma Hladki and your friends Jerry & Cecilia Hladki in B.C. enjoy recalling my many meetings with them over the years – although Gene preferred to remain in the Bush and have Hildegarde look after the Books. It was always interesting to catch up on what they were doing – farming, beekeeping, or leeches and minnows – always something new. Rest in peace – you earned it. We are saddened to hear of Gene’s passing. By now there is no doubt that he has already found the good fishing spots and has landed a few angler’s awards whereby he is now enjoying the rewards of a life well-lived. He was a great man. A hard worker. A great friend – and someone who fiercely loved his wife, Family & Friends, I was lucky to be one of them. With respect, love & and our sincerest condolences. Our thoughts and prayers are with you at this most difficult time. He will be missed by all. Everett – our sympathies to you on the loss of your father – a man who helped you create something great at White Spruce. Our deepest sympathy goes out to the family. May you find comfort in each other during this difficult time. Our prayers go out to you all. Eugene will be missed very much, as he was a wonderful and kind man. He will always be in our minds and hearts.